November 28th, 2016 is a date that will be long remembered in the town of Gatlinburg, Tennessee. As the town was returning to work after the Thanksgiving holiday, wind driven sparks from a neighboring fire (the Chimney Tops 2 fire, first reported on November 23rd) landed in the Gatlinburg area and ignited quickly, thanks to high winds and low humidity. What had become known as the 2016 Great Smoky Mountains wildfires rapidly consumed nearly 18,000 acres, claimed 14 lives and injured 134, becoming one of the most devastating natural disasters in Tennessee’s history. While Gatlinburg is itself a small town, home to approximately 4,000 people, it is surrounded on three sides by America’s most visited national park, the Great Smoky Mountains National Park, and the town hosts nearly 11 million visitors yearly. 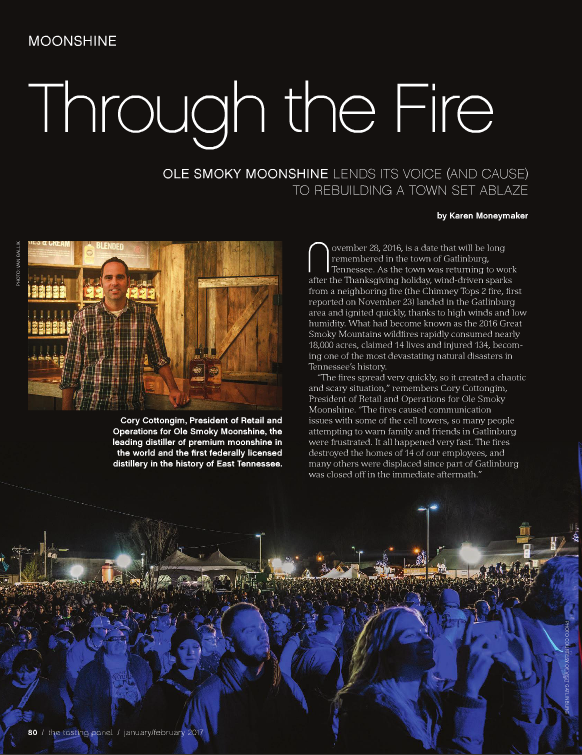 With the town shut down after the destruction of the fires, Ole Smoky Moonshine, Yee Haw Brewing Company, the Gatlinburg Convention and Visitors Bureau and Music City Roots answered the call to help, by organizing and hosting the Mountain Tough Benefit. Held on December 17th, the daylong festival raised money for the town of Gatlinburg and those affected by the devastating blaze. To make a contribution to the Sevier County Community Fund, visit https://etf.givingfuel.com/sevier-county-community-fund.